I have to convert my pictures to a cmyk profile for professional printing. I have received a specific (custom?) ".csf" file to process my files in Photoshop (please, see scs) from my professional "printing house". I would have liked to do this step in APhoto but I do not know how to setup a custom cmyk profile. Is it possible ? I see the same problem in APublisher and moreover, I do not find a way to export in pdf with the option to not assign again a profile to pictures. Anyway, since APub is still in beta phase, I am working with (and learning) QXP2018 but I would like to know how to proceed in APub. I think Photo cannot load cfs-file. It is a bundled colour setup file for Photoshop. Generally it should be enough to set right CMYK colour profile in colour settings and convert to that to get the right CMYK separation. CMYK profile should be part of the csf file. CMYK profile again contains settings for GCR/UCR, gains etc. I have received a specific (custom?) ".csf" file to process my files in Photoshop (please, see scs) from my professional "printing house". I think you'll need to ask your printing house for a standard .icc or .icm color profile, not something specific to PhotoShop. I did open the ".csf" file in PS to see the parameters hoping to be able to find similar data in APhoto. Indeed, in AP, one can not setup a custom profile. I think it would be interesting to be able to do so since the "printing houses" may have their habits and custom profile(s). For example, (sorry, I do not know the English terms for such a description) the total ink cover can not be higher than 280%... since I am not a pro, I do not know whether any pre-made profile (Fogra blabla...) fits into these recommendations. @v_kyr Thank you for these links : I knew the first one which is quite general about cmyk. I have my answer in the second. I just created a new thread in the Affinity Publisher forum to explain how I did what you are asking (on a Macintosh), but the post is still under review...not sure how long that takes since the offices are closed until January 2. In order to get the .csf to be available in APub, I first opened an InDesign document that contains colored text, black text (100K) and color photos/artwork that were assigned the .csf you want to use in APub. 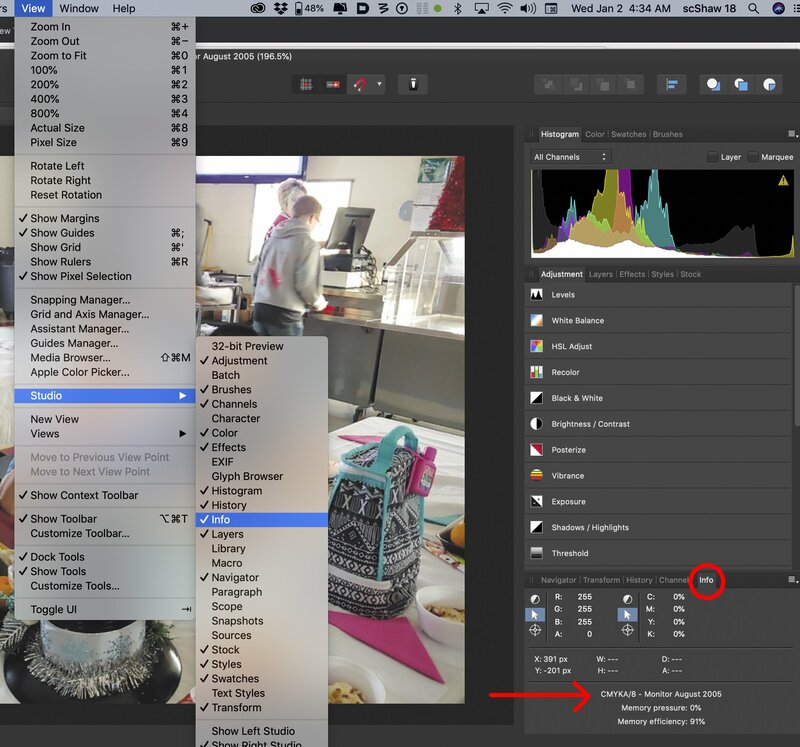 That .csf should have been available and used by IND, PS and AI through the Color Settings menu of Adobe Bridge (I am assuming you have done that so all your Adobe apps are synchronized to the same .csf). I then created a new document in APub using the following settings (I would upload a screenshot but that would probably get held as well for staff review). Also be aware this workflow is sort of tricking APub to accept/absorb the .csf for use later in creating other new APub documents...but you first have to get the .csf attached to an initial APub document. In the document setup dialog window set type to Print (Press Ready) under the Colour tab set Colour Format to CMYK/8, set Colour Profile to U.S. Web Coated (SWOP) v2 (need to start somewhere so this is a safe profile to use for the first doc). Now go back to the IND doc and select and copy some text with the IND text tool. Switch to the APub doc and using the Frame Text Tool (not the Artistic Text tool) create a text frame and paste the text copied from IND. The text should come in using the exact same font size, font weight and font color. What gets added (invisibly) at the same time is the .csf source working space profile. Keep adding more text copied from the IND doc, also place the exact same photos/artwork that were placed in the IND doc into the APub doc using its place tool. Save the APub doc and export as a PDF...doesn't really matter the settings used for this first PDF they will also be reset after the .csf is used by APub the first time. Now you can create a new APub doc and the source working space profile of the .csf will be in the drop down list of Colour Profiles (which in the first doc above you selected U.S. Web Coated (SWOP) v2). Be aware the .csf source working space profile name in the drop down list may be different then the .csf file name. In my case I was using a Goss press .csf named "goss 45u2.csf" and the source working space profile name was "Monitor August 2005" which had been provided by the press house I use for printing my InDesign projects. Find that name in the drop down list and finish creating your second CMYK/8 APub doc. That .csf profile will forever (I guess) be available for any new APub doc you create. I guess a picture is worth a thousands words, but hope this was not too long winded. I just created a new thread in the Affinity Publisher forum to explain how I did what you are asking (on a Macintosh), but the post is still under review. Thanks Percy. I will give it a try with one converted tif file. @percyn21 Copy/save from PS to APhoto did not work in my case but it seems to go well when I saved a file with the right format as a .psd file and opened it in APhoto. The cmyk profile seemed to be preserved and appeared in the drop down list. However, I can not check in APhoto the parameters as one can in PS... or can we ? With the photo open in APhoto, select the Studio option under the top-level View menu. When Studio is selected, there will be a popout side menu. Select Info and a palette will be selected with info about the photo. The info will list various data and indicate the CMYK profile. See attached screenshot. Now that the .csf info is in APhoto. You can easily "assign" it to any photo as an ICC profile. 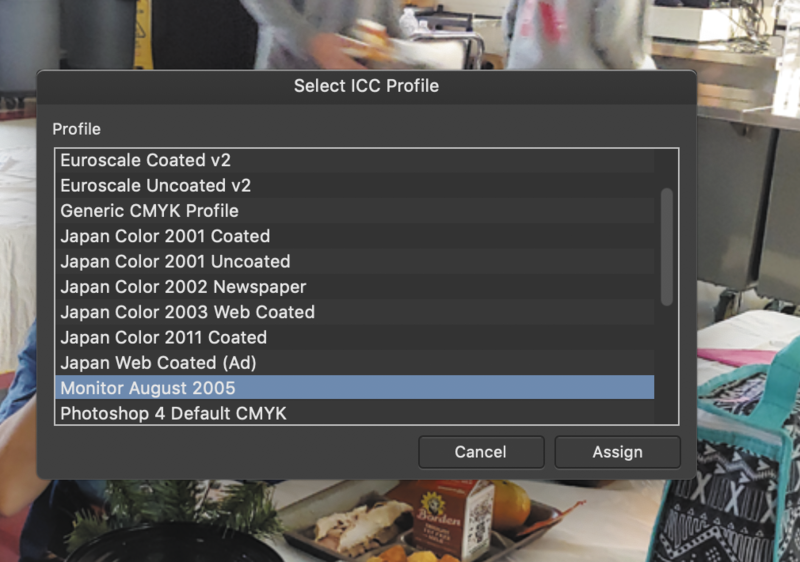 After opening an "unconverted" photo in APhoto, select the Assign ICC Profile... option under the top-level Document menu. A "Select ICC Profile" dialog box will open. Scroll through the ICC profiles and select the one you want to assign to the unconverted photo. Click the Assign button. 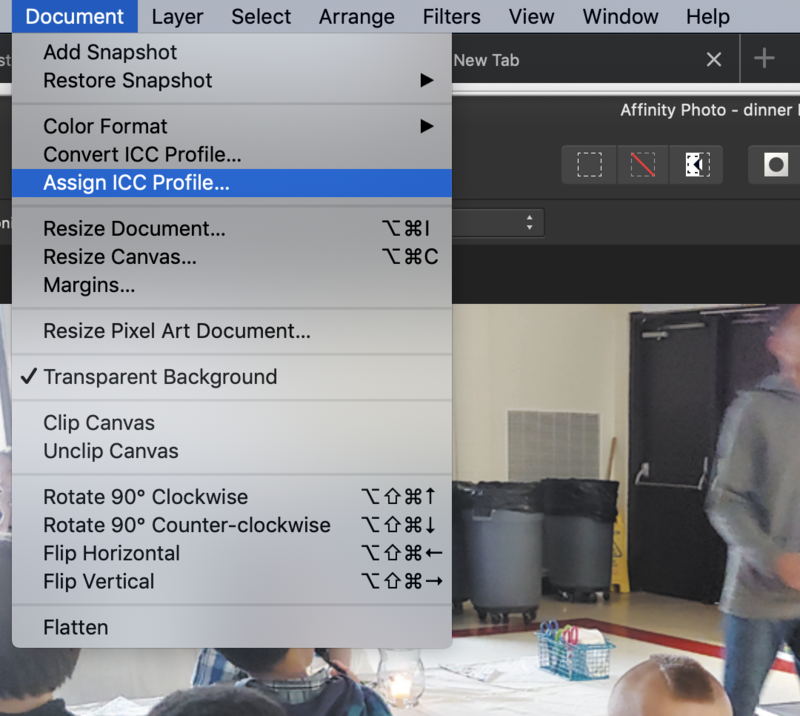 Save the photo and you now have a "converted" photo with the new ICC profile assigned to it. Yes, I saw this and I could indeed assign this profile to other pictures... brilliant ! I would have liked to check the parameters in APhoto but I do not think it is possible. I understand. I'm tryig to remember where you can check the ICC parameters in Photoshop to see s.values for GCR and other settings. I'll try to find where you can check those values either inside or outside of APhoto. I know how in PS : you select the profile in "Convert...", you choose "personal profile" and you get these details. However, I am not going to have PS for a long time now (and I do not want to use Adobe apps) and it would be nice to implement this possibility in Affinity suite. Yes, I see that now. Since the goss 45u2.csf had not ever been adjusted by my printer...I never really had to look at it again. But I can remember from years back trying to make my own profiles back when Apple provided some sort of color management tool called ColorSync...before the days when Adobe ruled many of us in the graphic designer world. There is a rather pricey app called Flightcheck by Markzware that does that, but it is all Adobe or QuarkXpress specific...no support for Affinity products. APhoto has a convert ICC tool but nothing like what you see in Photoshop. To check the values for the APhoto file with the goss 34u2.csf assignment, I exported it in APhoto using the setting for PSD as "PSD (preserve accuracy)". In Photoshop I then opened that PSD file and my original TIFF file (both files which used the goss 34u2.csf profile). The charts look identical. See screenshots side by side (the title at the top shows which is which). Well-handled check Thank you Percy. If you don't have access to Photoshop, you can send me your files (the one you have as the master you used to create the profile) and then one from APhoto that you export as a PSD (preserve accuracy) and I'l run the charts on those. That will work, also. Good!